Winter may be the perfect time to have your special day at our country wedding venue near Johannesburg, thanks to the clear, sunny skies and scenic surroundings, but it’s often a challenging time for floral arrangements. 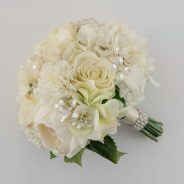 Here are some great ideas for a winter wedding bouquet. Paper flowers: If you’re feeling crafty, paper flowers are a great way of creating a visually interesting twist on the traditional bridal bouquet. Easy to make and inexpensive, all you need is some paper (why not use a copy of a romantic novel you love? ), florist’s wire and a glue gun. Go green: Just because there aren’t lots of flowers around, doesn’t mean you can’t have an organic bouquet! There’s beautiful conifer, ivy and fynbos to choose from, as well as decorative pine cones and grasses for an unusual and fragrant bouquet. White and silver: If you want a soft, snowy and winter-inspired bouquet, why not go for the classic combination of silver and white? Combine white roses with silver-dipped leaves and pinecones for a winter wonderland wedding. Berry: Berry colours add wintery warmth and give a dramatic contrast to a white wedding dress. Choose roses and flowers in rich purples, plums and reds, and add real berries for a natural, jewel-toned effect. Non-floral bouquets: Winter is the perfect season for shaking things up and doing something different, like a non-floral bouquet. Paper pinwheels, buttons, seashells, pearls, beads, wheat, fabric, paper butterflies and trinkets can all be pinned to polystyrene bouquet structures to create fanciful, eye-catching bouquets to match your theme and colours. Looking for the Perfect Wedding Venue? Look No Further! At Idle Winds, just 14kms from Fourways, we offer our clients a team of professional, experienced event staff to ensure that your day goes off perfectly. With onsite wedding planners, wait staff and chefs, we can assist you with everything from choosing linens and cutlery to setting up and taking down décor on the day. We are also happy to accommodate your own selection of service providers on the day. We also offer you and your wedding guests use of our onsite-accommodation. This consists of 58 well-appointed double and twin-sized rooms and you also have the option to include a wedding breakfast in your wedding package. If you would like to find out more about our wedding venue, reception and ceremony options as well as the wedding packages we offer, please contact us today. Our wedding planner and team will be happy to assist you and guide you around our beautiful country venue.